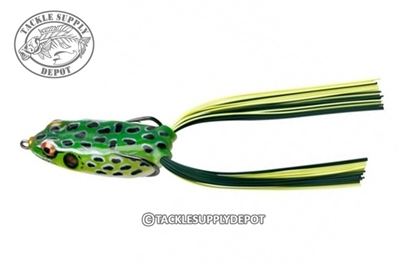 The Booyah Pad Crasher soft plastic hollow body frog features a plastic body design with just the right consistency to ensure solid, consistent hook-ups while remaining weed and snag free. The belly features 'chines' that make 'walking the frog' easy in open water, and it's just the right weight for pulling over slop or through the pads for big bass. Realistic decoration schemes and adjustable spinnerbait-style legs seal the deal for those lunkers lurking below. A drain hole at the tail of the bait keeps it working flawlessly and allows for ease in reliving water fill up.